Description: The “meeting point” of the northern and southern Luzon sub-faunal regions, the MBSCPL consists of four adjoining mountains, which is home to the remaining forest of Southern Luzon. The establishment and empowerment of an environmental constituency among the surrounding communities has helped build a social fence against threats to the area’s BCSD. Mt. Banahaw, one of the largest active volcanos in the Philippines with an elliptical crater, is also known as the Vulcan de Agua (the water volcano) because of the numerous springs that flow from its base. Its last recorded eruption in 1721 resulted in the formation of a lake in its crater. Its composition, which includes two adjoining mountains, host one of the largest tracts of forest in Southern Luzon. A major watershed for creeks, rivers, and falls draining into Laguna de Bay and Tayabas Bay. Caves found in the western portion of Mt. Banahaw-San Cristobal are popular base camps for religious and eco-tourist groups. Species endemism is rated highly in Mt. 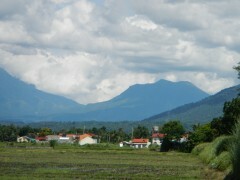 Banahaw, with scientific records noting a range of 66% to 76%. Plant diversity is high with 268 species, dominated by trees with moderately high diversity and even distribution. A total of 175 tree species have been found. 55 endemic plant species have been found, including 16 threatened species among vascular plants. There is also an abundance of pioneer species from the Moraceae and Meliaccaeae families. A new Rafflesia species endemic only to Mt. Banahaw, Rafflesia philippensis, was rediscovered in 2006. Endemic fauna include threatened species such as the Flame-breasted fruit dove (Ptilinopus marchei), Luzon tarictic hornbill (Penelopides manillae), and Southern Luzon Cloud Rat (Phloeomys cumingi). 72 of 84 bird species are endemic; 7 are threatened, including the Philippine eagle (Pithecophaga jefferyi) and Philippine cockatoo (Cacatua haematuropygia). 163 species of terrestrial fauna have been found here, including 19 newly documented species. 13 out of 22 mammal species are endemic, with 6 vulnerable. 18 of 29 amphibian species are endemic, with 11 threatened, 7 vulnerable, and 4 near-threatened. 12 of 18 reptile species are endemic, with two threatened species, the Sailfin Water Lizard (Hydrosaurus pustulatus) and the Highland Sphenomorphus (Sphenomorphus luzonense). Mount Banahaw is often associated with mysticism, superstition, and religion and is a well-known and frequented destination among pilgrims and other people seeking miracles or blessings. Unclear implementation of the National Integrated Protected Areas System (NIPAS) Act of 1992, leading to incomplete delineation of the protected landscape boundaries and a lack of planning and immediate implementation of Buffer Zone Management Activities. These result in unrestricted access to the protected area. Forest occupancy, unsustainable farming practices, and encroachment of farming activities in the protected landscape resulting from intensified economic pressures. Extraction of natural forest products, including illegal mining and quarrying, as well as wildlife resource extraction such as hunting, plant gathering, and timber poaching. The major community water sources are also being controlled and monopolized by consortiums that enclose these sources with water-impounding systems, thus reducing the water supply to a number of communities and also to various wild animal habitats. Poor knowledge and low appreciation of the significance of biodiversity and its conservation for sustainable development among communities within Banahaw. Pinagbakuran Multipurpose Cooperative for The Banahaw Mountaineers, Inc.
A “social fence” has been established around Mt. Banahaw, establishing an environmental constituency that is aware of the site’s ecological importance as a critical watershed and an important center of biodiversity, as well as its cultural reputation as a sacred mountain. Drafting of the Initial Protected Area Plan (IPAP) and the endorsement of the Mt. Banahaw-San Cristobal Protected Area Bill. Active stakeholder involvement for the protection and conservation of the area has been encouraged and catalyzed, resulting in enhanced community initiatives on monitoring and regenerating the site’s natural resources. 11 people’s organizations (POs) involved in the project have become more competent and proactive with their own project development and management, fund sourcing, networking, and membership strengthening. Community members have also become more vigilant in patrolling protected zones and enforcing local ordinances. Communities residing within the vicinity of the project sites were provided with more livelihood opportunities. POs were assisted in acquiring tenurial instruments. Legal assistance of forest wardens and information campaigns have ensured that the resources are safeguarded from continual abuse driven by economic demands. Planting of various indigenous tree species in ten hectares within the protected area, and the establishment of six hectares of PO-managed pilot farms in four communities. Ecological, social and institutional profiling and community mapping conducted in the MBSCPL. Foundation for the Philippine Environment. 2012. The Sacred Mountain: Mount Banahaw-San Cristobal Protected Landscape (KALIKASAN BCSD Knowledge Series Four). Quezon City, Philippines: Foundation for the Philippine Environment.